My regular readers know that I am a collector of huge amounts of trivia and facts relating to dogs. I love to learn about official and unofficial breeds, new gear, unusual laws, and any and all jobs for dogs. I am particularly fascinated by food as a topic in general, and so I try to find lots of stories about dog foods and recipes to share. Recently, while perusing the latest headlines relating to dogs, I discovered that Italy is now home to a grocery store that features dog-friendly shopping carts. Yes, you read that correctly – the carts are designed to allow dog owners to do their shopping and bring their pups along for the fun. I loved this concept and especially the fact that the store also takes pains to thoroughly clean each dog cart after it has been used. However, as I read more about dogs in Italy, I found a little detail that was pretty intriguing – it is easier to find canned cat food in great variety than it is to find canned dog foods. Does this mean that Italians don’t own as many dogs as cats? No, I soon learned, it means they are actually quite choosy about what they feed pets. So, I wondered, if the millions of pet owners are sticking to their guns and waiting for premium foods to appear, does it mean they make meals for the dogs and cats? I mean, Italy is famous for its astonishingly tasty foods, and it would be perfectly normal for Italians to pass on some of their love of good food to pets, right? In other words, would dogs enjoy Italian food? Well, I soon found the answer in a recently published dog food cookbook straight out of Italy itself! 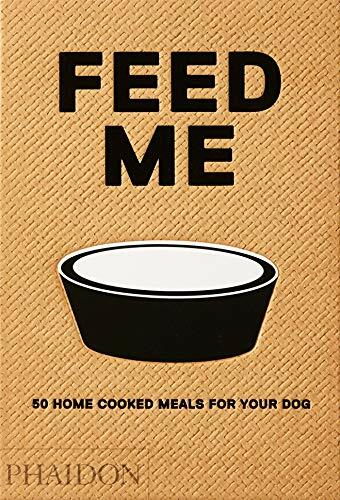 In the new cookbook Feed Me: 50 Home Cooked Meals for Your Dog, Italian author LivianaProla set out to create delicious and nutritious meals for dogs, and for loving dog owners to make. She began her quest to create delicious dishes based on the fact that illness and poor-quality food go hand in hand – whether it is people or pets. She created 50 recipes for dogs of all ages and the emphasis is on quality ingredients that allow dogs to savor delicious meals without preservatives or unhealthy additives. The author is a is a research scientist at the Department of Veterinary Science at Turin University, Italy, as well as a Doctor of Veterinary Science, a PhD in Animal Nutrition, president of the Italian Society of Animal Nutrition, and a diplomat at the European College of Veterinary and Comparative Nutrition. So, she really knows her stuff. Because I have yet to get my copy, I decided to dig around and see what others are saying about it. The general consensus is that it is a fabulous find, but with a few caveats. One is that every recipe is designed to deliver the same optimal nutrition as commercial foods. They all require the addition of a supplement known as Balance IT, and though pricey, it ensures that the meals provide even senior dogs with all they require for optimal health. Ingredients are pure and premium too, meaning excellent meats for each recipe. Now, before you wrinkle your nose and think that you won’t want to bulk up the grocery bill, I’d say reconsider. I do always advocate for balanceddiets and have repeatedly stated that human quality foods are not often adequate to a dog’s needs. This cookbook, though, seems the exception since it uses that supplement as a required ingredient for each recipe. The meals described in different reviews include such tasty treats as a “Beef Roll and Potatoes” that is shaped into a log and includes easily digested and nutrient dense kefir (a fermented, yogurt-like drink), as well as a Pasta Salad with Pork and Endives. This too features yogurt and was a solid thumbs up from the dogs lucky enough to taste test it for the reviewer. Dogs should NEVER eat tomatoes, so any Italian-themed dishes you make must be without any sort of tomato product. Also keep in mind that garlic and onions are poisonous to dogs, as well. In fact, I urge you to revisit my article on just this issue (Your Dog is Not a Human, So Don’t Feed Him Like One!) to be sure you never use ingredients with any potential risks. This dish uses savory pumpkin puree with pasta and turkey to create an irresistible, easy to make and entirely affordable entrée. Bake ground turkey at 350 until brown, remove and cool. Boil and drain pasta, pouring it into large mixing bowl. Stir the pumpkin and pasta together in a large bowl. Stir the turkey into the mix, and then the green beans. For humans, risotto is a treat. It is a time-consuming recipe that produces a silken rice dish full of subtle flavors and satisfying combinations. It is a main course dish and this spin on it is ideal for an adult dog with or without a delicate palette. Reduce heat and add the yogurt. Cover and cook for five minutes, stirring periodically. A bit more vegetable-heavy, and not as creamy in texture, this risotto variation is a great option when you have multiple dogs to feed and want to keep the costs at a very affordable range. In a Dutch Oven, add the turkey, water, rice and rosemary. Turn the burner to high heat and stir until the turkey meat is broken into evenly sized pieces. Bring to a boil and then reduce to low. Simmer for 20 minutes and then stir in the veggies, cooking for an additional 5 minutes. Remove from heat and cool before serving. Whether you serve this as a first course (it makes a lot and can easily be a nice little nibble or treat), or you have multiple dogs and need to do a big cook at once, this affordable and tasty dish can be easily tweaked to your dog’s preferences by adding a handful of parmesan, opting for a blend of veggies or even swapping out the chicken for pork or turkey. In a large pot, add the liver and rice along with water to cover by 1.5 to 2 times (i.e. a ratio of 2 to one). Cook for 20-40 minutes – until rice is done and fluid absorbed. If you need to add more fluid to rice to cook fully, do so. In a roasting dish, season the meat and cook at 400 degrees until cooked through. Cook the pasta and drain it over a colander in which the vegetables have been placed and partially thawed. In a huge bowl or pot, pour the rice and chicken livers and the pasta and veggies. If you must pull meat from the bone, do so over the pot and allow juices to fall into the mixture. Pour the pan juices into the mix, add the cottage cheese and stir well. Serve when cool enough to enjoy, refrigerating leftovers. 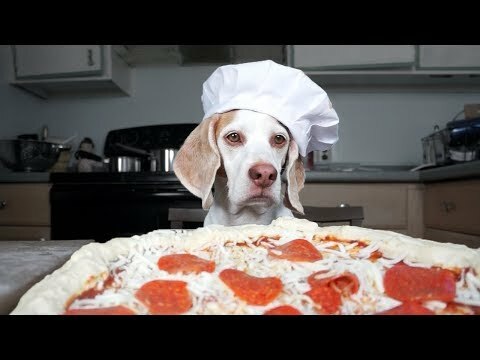 You love pizza, I love pizza, everyone loves pizza, and that includes your dogs. So why not whip up a pie for them on a Friday night! Make the crust by combining all of the ingredients and spreading them in a round cake or pizza pan. While cooking, prepare the toppings. Remove crust from oven and cool briefly, then top with the toppings as you would a normal pizza with pumpkin puree, meat and then cheeses. Return to the oven and reduce it 200 degrees. Bake for 10 more minutes. This makes six “pupcakes” and is a great recipe if you want to keep some “sweet” treats on hand for your dogs. It can also be a lot of fun to make this one for the friends at the dog park whenever a special event, birthday or celebration is occurring! With your mixer beat eggs with oil and sugar [or honey] until well mixed. Stir in the grated carrots. Fold in carob chips, if using. Cool completely before decorating with a bit of peanut butter or melted carob chips – never chocolate! With these simple, and affordable recipes, you’ll get your pups ready for even more gourmet treats based on different Italian recipes and dishes. Mangiare!